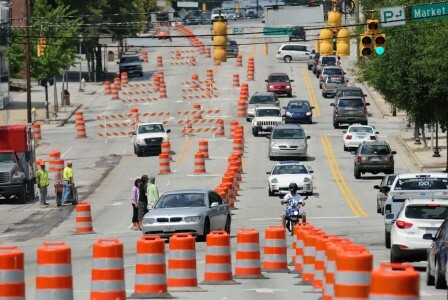 The road construction around Wilmington, North Carolina is supposed to ease traffic and pedestrian flow while improving the infrastructures of the city. In the mean time the road closures and construction zones have been causing delays and traffic congestion. In particular the construction on 3rd Street in downtown Wilmington has been causing delays for those traveling into and out of downtown. The construction and improvement project on 3rd street in downtown Wilmington began in August and the project duration is expected to last for 13 months. The project budget is $9.4 million, which was funded through a 2006 bond referendum. The project is located from the stretch of road from Market Street to Davis Street and reflects the similar improvement projects on Front Street. There are expected delays and slow downs due to the construction and renovation improvements. There has already been one delay with the improvement project within the first few weeks of the project. The delay is due to the discovery of an underground shelter with four storage tanks that are in the way of the new water and sewer lines that are being installed. The old tanks contain liquids such as gas and oil, which require an environmental engineer to remove them which will cost $15,000 each to remove. The money to remove the old tanks will come out of the project’s contingency fund and while the discovery of the tanks has delayed the project there is an expectation for it to be completed by September 2012. The reason for this project is due to the aging water and sewer pipes that run underneath 3rd street and to convert overhead utilities to run underground. The above ground construction is to renovate the streetscape during the underground construction in order to minimize the disruption that will be caused during the construction period. These renovations and updates are necessary due to various reasons. The overhead utilities are being moved underground to reduce the potential for damage and to improve the aesthetics of the downtown cityscape. The water and sewer pumps that run under 3rd street are up to 100 years old in certain areas. The traffic flow is planned to be improved through making downtown more accessible and pedestrian-friendly through improving the road which is considered a major gateway into the city. Work hours expected for this project are 7 am until 6 pm, Mondays through Fridays with some construction on nights and weekends as deemed necessary. Expect delays from lane closures on the west side of 3rd street that have been extended to the Grace street intersection with no parking zones having been extended to the north of the Walnut Street intersection. There are no left turns allowed off of 3rd Street at Princess, Chestnut and Grace Streets with a detour for motorists to use 5th Avenue. Intersections along 3rd Street may be closed as necessary. Pedestrian access and walkways will be moved from in front of buildings as necessary with some temporary structures.